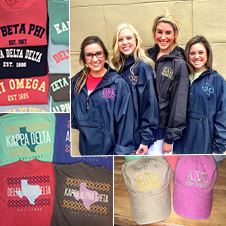 For a limited time, our best selling Bid Day gifts are still available. Don't forget to add one to your basket before they're gone! Two Great Styles Traditional or Fiesta! Signature boards for fraternities, sororities, or just for fun! Call 806-765-9901 and Ask About Our Discounts for Online Paddle Parties. For fraternity paddles, sorority paddles or any other custom Greek gift your number one source is Paddle Tramps. For 57 years Paddle Tramps has produced the highest quality fraternity paddles, sorority paddles and Greek gifts available. In the early 1960s we developed the Greek award paddle concept. For decades we have offered custom paddles without handles called sorority boards. Today we're bringing you new custom shapes and sizes. 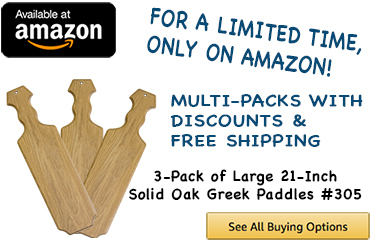 For traditional fraternity paddles check out our Giant and Little Giant Greek Paddles. For a custom shaped sorority board take a look at our new Symbol Plaques. Looking for a gift item? We now offer some of the most sought-after Greek gifts available. Whether you're looking for traditional fraternity paddles or custom Greek paddles you're sure to find a Greek paddle or gift for your next project in our large selection!